Continuous Integration is the practice of testing each change done to your codebase automatically and as early as possible. Continuous Delivery follows the testing that happens during Continuous Integration and pushes changes to a staging or production system. 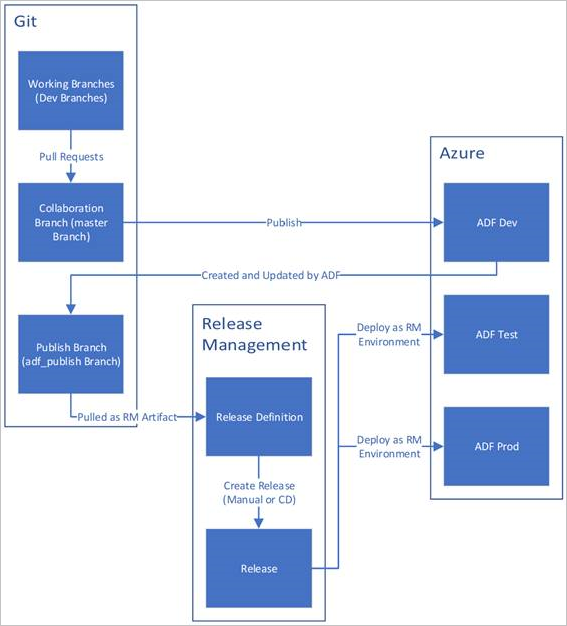 For Azure Data Factory, continuous integration & delivery means moving Data Factory pipelines from one environment (development, test, production) to another. 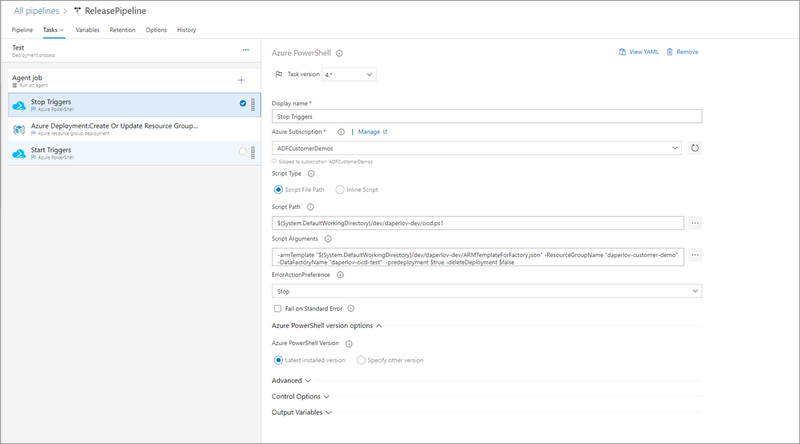 To do continuous integration & delivery, you can use Data Factory UI integration with Azure Resource Manager templates. The Data Factory UI can generate a Resource Manager template when you select the ARM template options. When you select Export ARM template, the portal generates the Resource Manager template for the data factory and a configuration file that includes all your connections strings and other parameters. Then you have to create one configuration file for each environment (development, test, production). The main Resource Manager template file remains the same for all the environments. Select Export ARM template to export the Resource Manager template for your data factory in the development environment. Then go to your test data factory and production data factory and select Import ARM template. 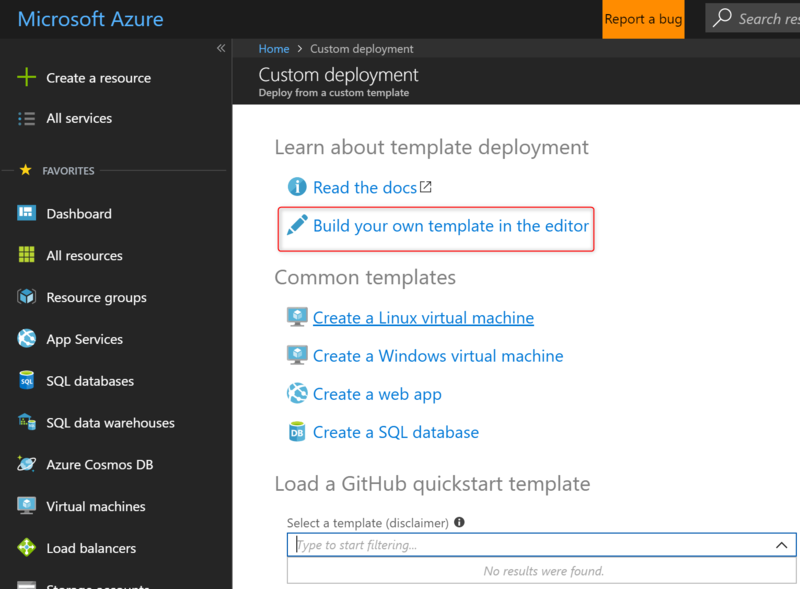 This action takes you to the Azure portal, where you can import the exported template. Select Build your own template in the editor and then Load file and select the generated Resource Manager template. Provide the settings, and the data factory and the entire pipeline is imported in your production environment. Select Load file to select the exported Resource Manager template and provide all the configuration values (for example, linked services). Connection strings. You can find the info required to create connection strings in the articles about the individual connectors. For example, for Azure SQL Database, see Copy data to or from Azure SQL Database by using Azure Data Factory. To verify the correct connection string - for a linked service, for example - you can also open code view for the resource in the Data Factory UI. In code view, however, the password or account key portion of the connection string is removed. To open code view, select the icon highlighted in the following screenshot. 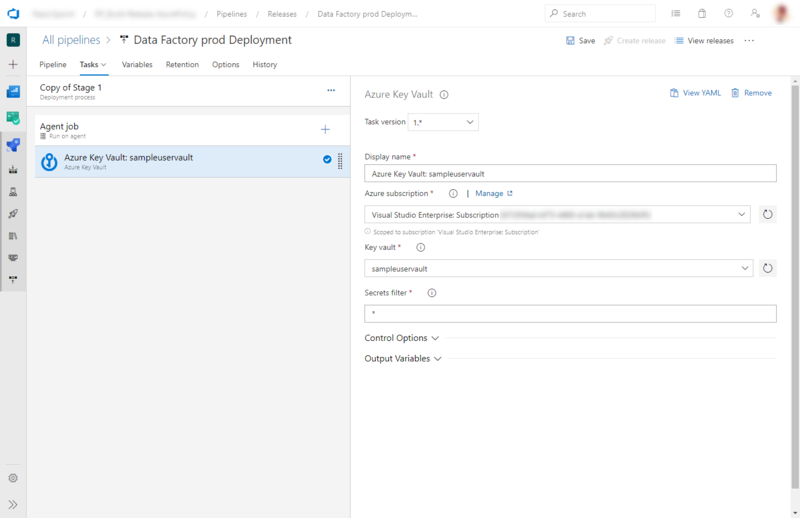 Set up a development data factory with Azure Repos in which all developers can author Data Factory resources like pipelines, datasets, and so forth. Then developers can modify resources such as pipelines. As they make their modifications, they can select Debug to see how the pipeline runs with the most recent changes. After developers are satisfied with their changes, they can create a pull request from their branch to the master branch (or the collaboration branch) to get their changes reviewed by peers. After changes are in the master branch, they can publish to the development factory by selecting Publish. When the team is ready to promote changes to the test factory and the production factory, they can export the Resource Manager template from the master branch, or from any other branch in case their master branch backs the live development Data Factory. The exported Resource Manager template can be deployed with different parameter files to the test factory and the production factory. 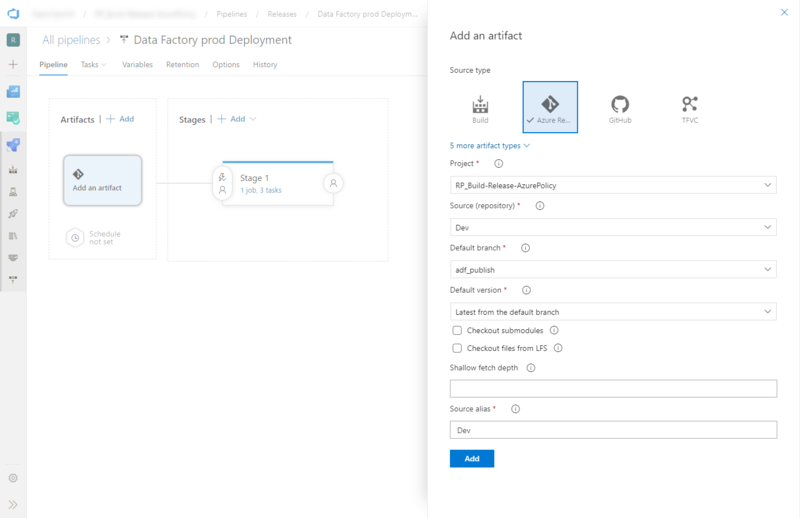 Here are the steps to set up an Azure Pipelines release so you can automate the deployment of a data factory to multiple environments. 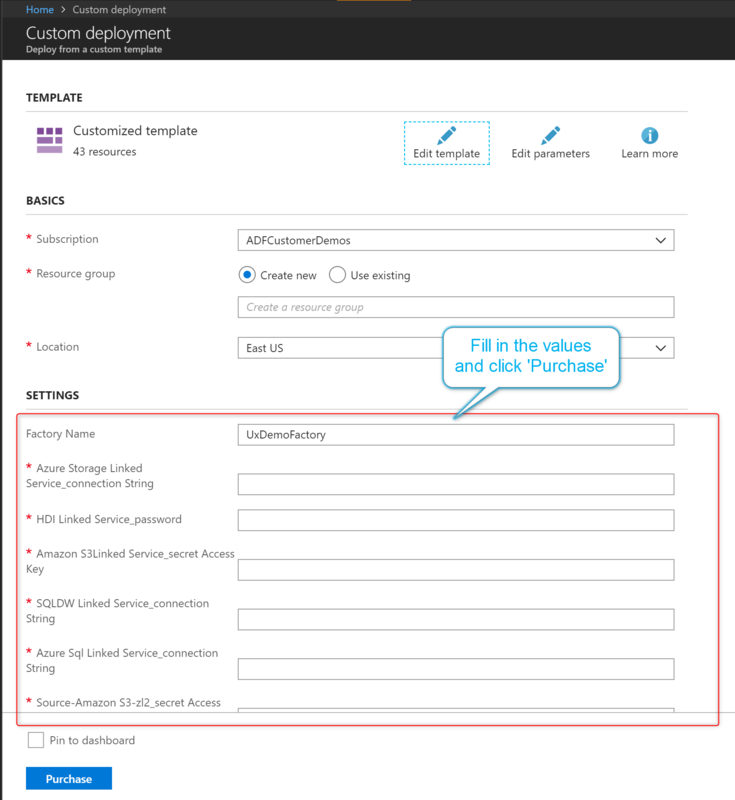 An Azure subscription linked to Team Foundation Server or Azure Repos using the Azure Resource Manager service endpoint. A Data Factory with Azure Repos Git integration configured. An Azure Key Vault containing the secrets. Go to your Azure Repos page in the same project as the one configured with the Data Factory. Click on the top menu Azure Pipelines > Releases > Create release definition. Select the Empty process template. Enter the name of your environment. Add a Git artifact and select the same repo configured with the Data Factory. Choose adf_publish as the default branch with latest default version. a. Create new task, search for Azure Resource Group Deployment, and add it. b. In the Deployment task, choose the subscription, resource group, and location for the target Data Factory, and provide credentials if necessary. c. Select the Create or update resource group action. d. Select … in the Template field. Browse for the Resource Manager template (ARMTemplateForFactory.json) that was created by the publish action in the portal. Look for this file in the folder <FactoryName> of the adf_publish branch. e. Do the same thing for the parameters file. Choose the correct file depending on whether you created a copy or you’re using the default file ARMTemplateParametersForFactory.json. f. Select … next to the Override template parameters field and fill in the information for the target Data Factory. For the credentials that come from key vault, use the same name for the secret in the following format: assuming the secret’s name is cred1, enter "$(cred1)" (between quotes). g. Select the Incremental Deployment Mode. If you select Complete deployment mode, existing resources may be deleted, including all the resources in the target resource group that are not defined in the Resource Manager template. Create a new release from this release pipeline. If you have secrets to pass in an Azure Resource Manager template, we recommend using Azure Key Vault with the Azure Pipelines release. Add the secrets to parameters file. For more info, see Use Azure Key Vault to pass secure parameter value during deployment. "secretName": " < secret - name > "
When you use this method, the secret is pulled from the key vault automatically. The parameters file needs to be in the publish branch as well. Select the Tasks tab, create a new task, search for Azure Key Vault and add it. In the Key Vault task, choose the subscription in which you created the key vault, provide credentials if necessary, and then choose the key vault. The Azure Key Vault task may fail the fIntegration Runtime time with an Access Denied error. Download the logs for the release, and locate the .ps1 file with the command to give permissions to the Azure Pipelines agent. You can run the command directly, or you can copy the principal ID from the file and add the access policy manually in the Azure portal. (Get and List are the minimum permissions required). In the Tasks tab of the release, search for Azure Powershell and add it. Choose Azure Resource Manager as the connection type and select your subscription. You can follow similar steps and use similar code (with the Start-AzDataFactoryV2Trigger function) to restart the triggers after deployment. In continuous integration and deployment scenarios, the Integration Runtime type across different environments must be the same. For example, if you have a Self-Hosted Integration Runtime (IR) in the development environment, the same IR must be of type Self-Hosted in other environments such as test and production also. Similarly, if you're sharing integration runtimes across multiple stages, you have to configure the Integration Runtimes as Linked Self-Hosted in all environments, such as development, test, and production. Here is a sample deployment template that you can import in Azure Pipelines. "name": "Latest from default branch"
Here is a sample script to stop triggers before deployment and to restart triggers afterwards. The script also includes code to delete resources that have been removed. To install the latest version of Azure PowerShell, see Install Azure PowerShell on Windows with PowerShellGet. You use automated CI/CD and you want to change some properties during Resource Manager deployment, but the properties aren't parameterized by default. Your factory is so large that the default Resource Manager template is invalid because it has more than the maximum allowed parameters (256). Under these conditions, to override the default parameterization template, create a file named arm-template-parameters-definition.json in the root folder of the repository. The file name must exactly match. Data Factory tries to read this file from whichever branch you are currently on in the Azure Data Factory portal, not just from the collaboration branch. You can create or edit the file from a private branch, where you can test your changes by using the Export ARM template in the UI. Then, you can merge the file into the collaboration branch. If no file is found, the default template is used. Here are some guidelines to use when you author the custom parameters file. The file consists of a section for each entity type: trigger, pipeline, linkedservice, dataset, integrationruntime, and so on. Enter the property path under the relevant entity type. When you set a property name to '*'', you indicate that you want to parameterize all properties under it (only down to the first level, not recursively). You can also provide any exceptions to this. When you set the value of a property as a string, you indicate that you want to parameterize the property. Use the format <action>:<name>:<stype>. = means keep the current value as the default value for the parameter. - means do not keep the default value for the parameter. | is a special case for secrets from Azure Key Vault for connection strings or keys. <name> is the name of the parameter. If it is blank, it takes the name of the property. If the value starts with a - character, the name is shortened. For example, AzureStorage1_properties_typeProperties_connectionString would be shortened to AzureStorage1_connectionString. <stype> is the type of parameter. If <stype> is blank, the default type is string. Supported values: string, bool, number, object, and securestring. When you specify an array in the definition file, you indicate that the matching property in the template is an array. Data Factory iterates through all the objects in the array by using the definition that's specified in the Integration Runtime object of the array. The second object, a string, becomes the name of the property, which is used as the name for the parameter for each iteration. It's not possible to have a definition that's specific for a resource instance. Any definition applies to all resources of that type. By default, all secure strings, such as Key Vault secrets, and secure strings, such as connection strings, keys, and tokens, are parameterized. Any property in the path activities/typeProperties/waitTimeInSeconds is parameterized. This means that any activity in a pipeline that has a code-level property named waitTimeInSeconds (for example, the Wait activity) is parameterized as a number, with a default name. But, it won't have a default value in the Resource Manager template. It will be a mandatory input during the Resource Manager deployment. Similarly, a property called headers (for example, in a Web activity) is parameterized with type object (JObject). It has a default value, which is the same value as in the source factory. Only properties, and all properties, under the path typeProperties are parameterized, with their respective default values. For example, as of today's schema, there are two properties under IntegrationRuntimes type properties: computeProperties and ssisProperties. Both property types are created with their respective default values and types (Object). Under typeProperties, two properties are parameterized. The first one is maxConcurrency, which is specified to have a default value, and the type would be string. It has the default parameter name of <entityName>_properties_typeProperties_maxConcurrency. The recurrence property also is parameterized. Under it, all properties at that level are specified to be parameterized as strings, with default values and parameter names. An exception is the interval property, which is parameterized as number type, and with the parameter name suffixed with <entityName>_properties_typeProperties_recurrence_triggerSuffix. Similarly, the freq property is a string and is parameterized as a string. However, the freq property is parameterized without a default value. The name is shortened and suffixed. For example, <entityName>_freq. Linked services is unique. Because linked services and datasets can potentially be of several types, you can provide type-specific customization. For example, you might say that for all linked services of type AzureDataLakeStore, a specific template will be applied, and for all others (via *) a different template will be applied. In the preceding example, the connectionString property will be parameterized as a securestring value, it won't have a default value, and it will have a shortened parameter name that's suffixed with connectionString. The property secretAccessKey, however, happens to be an AzureKeyVaultSecret (for instance, an AmazonS3 linked service). Thus, it is automatically parameterized as an Azure Key Vault secret, and it's fetched from the key vault that it's configured with in the source factory. You can also parameterize the key vault, itself. Even though type-specific customization is available for datasets, configuration can be provided without explicitly having a *-level configuration. In the preceding example, all dataset properties under typeProperties are parameterized. The default parameterization template can change, but this is the current template. This will be useful if you just need to add one additional property as a parameter, but also if you don’t want to lose the existing parameterizations and need to re-create them. If you've set up continuous integration and deployment (CI/CD) for your Data Factories, you may observe that, as your factory grows bigger, you run into the Resource Manager template limits, like the maximum number of resources or the maximum payload in a Resource Manager template. For scenarios like these, along with generating the full Resource Manager template for a factory, Data Factory also now generates Linked Resource Manager templates. As a result, you have the entire factory payload broken down into several files, so that you don’t run into the mentioned limits. If you have Git configured, the linked templates are generated and saved alongside the full Resource Manager templates, in the adf_publish branch, under a new folder called linkedTemplates. The Linked Resource Manager templates usually have a master template and a set of child templates linked to the master. The parent template is called ArmTemplate_master.json, and child templates are named with the pattern ArmTemplate_0.json, ArmTemplate_1.json, and so on. 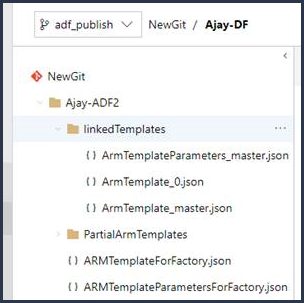 To move over from using the full Resource Manager template to using the linked templates, update your CI/CD task to point to ArmTemplate_master.json instead of pointing to ArmTemplateForFactory.json (that is, the full Resource Manager template). Resource Manager also requires you to upload the linked templates into a storage account so that they can be accessed by Azure during deployment. For more info, see Deploying Linked ARM Templates with VSTS. Remember to add the Data Factory scripts in your CI/CD pipeline before and after the deployment task. If you don’t have Git configured, the linked templates are accessible via the Export ARM template gesture. Git Integration. You are only required to configure your Development data factory with Git integration. Changes to Test and Production are deployed via CI/CD, and they don't need to have Git integration. Data Factory CI/CD script. Before the Resource Manager deployment step in CI/CD, you must take care of things like stopping the triggers, and different kind of factory cleanup. We recommend using this script as it takes care of all these things. Run the script once before the deployment, and once after, using appropriate flags. Integration Runtimes and sharing. Integration Runtimes are one of the infrastructural components in your data factory, which undergo changes less often, and are similar across all stages in your CI/CD. As a result, Data Factory expects you to have the same name and same type of Integration Runtimes across all stages of CI/CD. If you are looking to share Integration Runtimes across all stages - for instance, the Self-hosted Integration Runtimes - one way to share is by hosting the Self-hosted IR in a ternary factory, just for containing the shared Integration Runtimes. Then you can use them in Dev/Test/Prod as a Linked IR type. Key Vault. When you use the recommended Azure Key Vault based linked services, you can take its advantages one level further by potentially keeping separate key vaults for Dev/Test/Prod. You can also configure separate permission levels for each of them. You may not want your team members to have permissions to the Production secrets. We also recommend you to keep the same secret names across all stages. If you keep the same names, you don't have to change your Resource Manager templates across CI/CD, since the only thing that needs to be changed is the key vault name, which is one of the Resource Manager template parameters. You can't publish individual resources, because data factory entities depend on each other. For example, triggers depend on pipelines, pipelines depend on datasets and other pipelines, etc. Tracking changing dependencies is hard. If it was possible to select the resources to publish manually, it would be possible to pick only a subset of the entire set of changes, which would lead to things unexpected behavior after publishing. You can't publish from private branches. You can't host projects on Bitbucket.